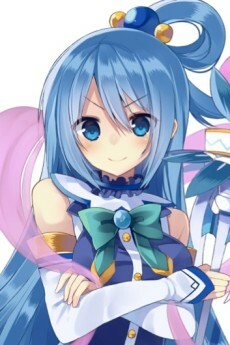 Aqua is a goddess of water. She guides humans who die young to the afterlife. Due to her cocky attitude towards Kazuma, she ends up being dragged to another world with him to defeat the Demon King. Aqua chose the advanced job of archpriest, as being a goddess she is naturally a strong wielder of healing magic. However, she spends most of her skillpoints on party trick skills.